. : Age of Empires: The Rise of Rome :. Home / PC game manuals / Age of Empires: The Rise of Rome :. Age of Empires: The Rise of Rome manual Just click to open it in a new window then print the manual. Just as the Romans rose up and became the most advanced and powerful nation in the Western Hemisphere at the turn of the millenium, so too do the Romans replace the old civilizations to reign supreme in Ensemble's Age of Empires expansion pack, Rise of Rome. With the planned sequel to Age of Empires pushed back to the middle of next year, the Rise of Rome expansion pack took on new meaning. Not only is it supposed to enhance the value of this year-old favorite, but it also serves as a bridge between Age of Empires and Age of Empires II. Age of Empires loosely followed the growth of the ancient civilizations, Rise of Rome is set during the reign of the Roman empire in the West, and Age of Empires II is to be set in the dark ages, after the infrastructure established by the Romans crumbled into warring pieces. As both a dessert for Age of Empires fans and an appetizer for Age of Empires II, Rise of Rome is a series of hits and misses. I am a huge fan of the original game. I played numerous multiplayer games and even gave the single-player campaigns a good, honest try. I didn't really mind the unit limit or the questionable pathfinding. And I forgave the inadequacies of the single-player campaign because I loved multiplayer matches so much. 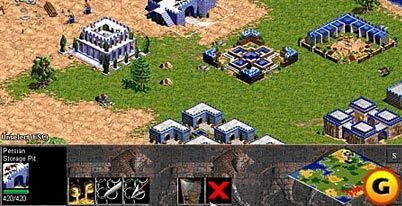 There were many that loved Age of Empires as much as I did, but there were others that just couldn't play this game because of a few problems. I couldn't really see these problems a year ago when I was first enamored of the game, but today, I finally see just what all the fuss was about: This game is far from perfect, and it has a few shortcomings that detract from the play experience. The Rise of Rome expansion offers five new units, four new civilizations, four new technologies, four new campaigns, and a few user enhancements like unit queues. As expansion packs go, this one is crammed with goodies. Most of the five units were added in response to balance problems in Age. The slinger is a barracks unit that exists to counter the tool age bowman rush. The camel rider serves a similar purpose against the Bronze Age cavalry rush. The scythe chariot was created for those civilizations that lacked a heavy Iron Age cavalry unit. The armored elephant was introduced because the war elephant just wasn't being used enough. There wasn't an imbalance on the high seas, but the fire galley was nevertheless brought in to expand naval combat. All the units are useful, but you won't soon forget the old units because these new ones are either highly specialized or expensive to research. The new additions found in Rise of Rome don't really change the game significantly, although they do spice up matches. The slingers and camel riders do mitigate certain rushes, but the game remains fundamentally the same, and some Rise of Rome games will end without the need to ever build an expansion unit.